For years horse owners and veterinarians blamed low thyroid hormone levels, or hypothyroidism, for a myriad of both benign and serious horse conditions such as laminitis, a grave hoof condition; anhidrosis, an inability to sweat; tying up, or exertional rhabdomyolysis; fertility problems; and just being fat. Early in the 2000s equine researchers shot holes in these beliefs, demonstrating that hypothyroidism as a primary condition is very rare in horses. If you suspect thyroid trouble in your horse, it’s more likely another condition causing his problems. If your horse has primary hypothyroidism, something is wrong with the thyroid gland that prevents it from producing the proper amount of hormones. Goiters are an example—his thyroid gland is enlarged due to tumors that may or may not be benign. Malignant ones cause thyroid dysfunction—primary hypothyroidism. 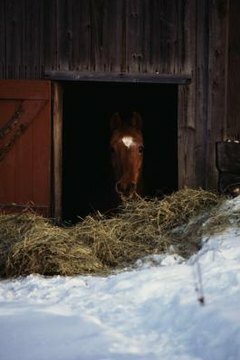 Older horses are more prone to this condition, but it is still very rare. More commonly, a thyroid dysfunction is caused by other issues that then affect his thyroid. Look for hair that is rough and slow to shed, less interest in food, exercise and cold intolerance, low heart and respiratory rate and some swelling in his hind legs. If he’s overweight, this is not a thyroid problem; it’s a feeding program problem that can lead to serious health issues. When your horse was young, he relied on thyroid hormones to develop his brain and his body normally. As he matured, this proper amount of hormones dictated his metabolism—how he stores fat and burns or metabolizes his food. If he has high hormone levels or a high metabolism, he burns his calories quickly. If his metabolism is too high, he burns his fuel—his food—less efficiently. Your horse has two thyroid hormones: triiodothyronine, or T3, and tyhroxine, or T4. There’s a good chance that if your vet does a routine blood test on your horse, both these hormones will be low, tempting a diagnosis of hypothyroidism. However, if your vet had done the same blood panel a week earlier, they could easily have shown normal levels—and "normal" spans a wide range. These variations are normal and one reason equine thyroid conditions have been widely misunderstood. It’s possible your horse’s thyroid is compromised by another condition, making it either secondary or tertiary hypothyroidism, or euthyroid sick syndrome. If he has secondary hypothyroidism, his body is not producing enough TSH, or thyroid stimulating hormone. When TSH is low, his thyroid gland won’t produce enough thyroid hormones. With tertiary hypothyroidism, his hypothalamus is not releasing enough TRH—thyroid releasing hormone. This causes another chain reaction, as TRH stimulates production of TSH, which in turn affects thyroid hormones. If he has a chronic illness that is causing low thyroid hormones, he has euthyroid sick syndrome. If your horse has thyroid dysfunction, your vet will likely prescribe thyroid hormone supplements. If his hypothyroidism is caused by another condition, however, hormone supplements may make him feel better but won’t treat the underlying cause of the hormone deficiency. Evaluate your horse’s nutrition: if he is not getting enough iodine and selenium, these deficiencies can cause low thyroid hormone production. Feeding him the correct amount of iodine will also reduce his chances of getting a goiter. Other necessary minerals are zinc, copper, manganese and iron. Veterinarians now know that conditions such as Cushing’s disease and insulin resistance, which were blamed on hypothyroidism in the past, can actually cause low hormone production. You have to treat those conditions first to get your horse’s thyroid back on track.